QUINCY — Catholics and Protestants smiled and warmly greeted one another at the First Church of Squantum in between two Easter services yesterday. As members of First Church concluded their celebration, parishioners from the neighboring Mary Star of the Sea filed in for their first Easter service away from their church, shuttered and darkened a few blocks away, its doors locked and its future uncertain. They took Communion blessed by a priest, but there was no priest to officiate at the service. Mary Star of the Sea Church was formally closed by the Vatican in September 2010 after a lengthy appeals process. It was one of 80 churches slated for closure by the Catholic Church in 2004. Since the last Mass was said, parishioners have struggled to retain their identity and sense of community after losing a church many felt was a linchpin that held the close-knit seaside neighborhood together. Across the region yesterday, on one of Christianity’s most sacred days, many Catholics met with the harsh realities of honoring the day without the parishes that had been cornerstones in their lives. Outside St. Frances X. Cabrini Church in Scituate yesterday morning, Nels Lindblom, 41, of Scituate, stood with his toddler daughter, who had grown restless during the 10 a.m. Easter services led by parishioners. The parish has not had a priest to officiate its Easter service since the Boston Archdiocese announced its closure and intent to sell the property about 6 1/2 years ago. Parishioners continue to maintain a 24-hour vigil, taking turns sleeping at the church, so that no one can lock them out. “The archdiocese kind of walked away from us,’’ said John Rogers, who led the service. Outside the church, children scurried around looking for hidden candy in the parish Easter egg hunt. In Squantum, Kenney said she was very grateful to her United Church of Christ neighbors at First Church of Squantum, for allowing them to use their church, but it was a bittersweet experience. “It’s everything. It’s part of me; it’s part of my family; it’s part of this neighborhood,’’ Kenney said. First Church’s pastor, Michael Robertson, said that church members were very much in favor of sharing their building with their Catholic neighbors. Sean Glennon, cochairman of the Friends of Star of the Sea, a group of parishioners that is fighting to reopen the church, said the organization was awaiting a decision by Cardinal Sean P. O’Malley on whether the church building will be deconsecrated and sold. Glennon said his group would appeal any such decision to Vatican courts and even the pope if necessary. 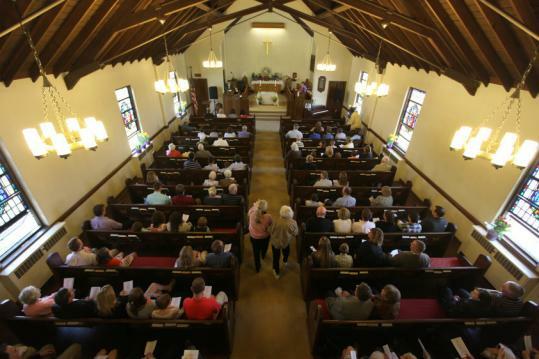 After the service, many of the parishioners spoke of the difficulty of going on without a church that had been such a central connection in their lives. “It’s like I lost a friend or relative,’’ said Paul McCormack, a member of the church for more than 55 years. Without a place for weddings, christenings, and funerals, many felt they were losing touch with their neighbors. Antonuccio said the recent campaign by the archdiocese to reach out to lapsed Catholics, called Catholics Come Home, was an insult to those who had lost their churches. In Scituate, Janie Avery, 62, of Scituate, who has gone to St. Frances for the past five years, said she prefers to attend services led by laypeople. Sharon Harrington, 60, also of Scituate, also noted some benefit to the absence of priests from services. “It’s especially moving to me to see women up on the altar,’’ Harrington said. Rogers sees the continued attendance each week despite not having a priest as a testament to faith among parishioners. Harrington said she believes the practice of holding church services without a priest will catch on at parishes across the globe. Stewart Bishop can be reached at sbishop@globe.com; Sean Teehan at steehan@globe.com.